Carved wooden representation of the KAA shield. Highest scoring junior Gentleman recurve archer, shooting the York round. 31 Aug 2013: It is uncommon for juniors to enter the senior round, to the point that any who do are almost always unopposed. The quality and condition of the trophy was considered too low. 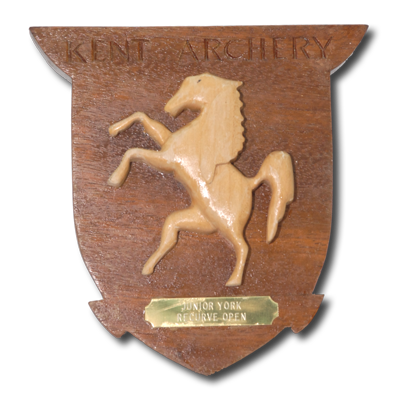 Open award - available to members of the Kent Archery Association and visitors. Open to junior gentlemen of all age groups, shooting the York round with the recurve bow.